Marlene sure enjoyed a classic turtle neck, and she was on my mind when this design came into view. Introducing M's Favorite, a slim, shaped pullover with extra-long sleeves and a steep collar all trimmed with 4x4 ribbing – a wide paneled repeat that is more decorative than it is elastic. This piece is worked top down in the round. Stitches are picked up around the neckline for the turtle collar, and around the armhole for the set-in sleeves. The top-down sleeves are worked in the cap method defined by Elizabeth Doherty in her publication Top Down: Reimagining Set-in Sleeve Design. 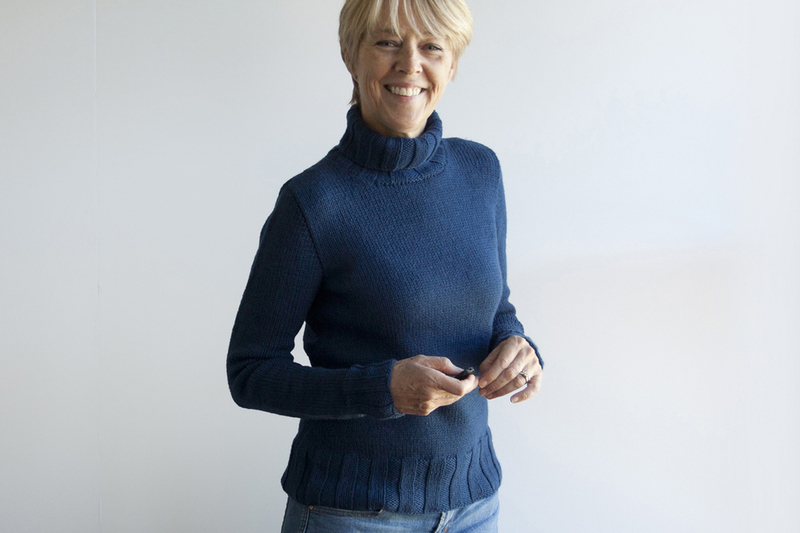 Simple and classic – an enjoyable knit! This pattern is available for both worsted and sport weight yarns. 8, 9, 9, 10, 11, 12, 13 skeins, or for comparable yarn, approx 1305, 1475, 1625, 1785, 1970, 2155, 2315 yds / 1195, 1350, 1490, 1635, 1805, 1970, 2120 m.
Shown in Cascade 220 wool by Cascade Yarns. (100% Peruvian Highland wool; 220 yds / 200 m per 3.5 oz / 100 g skein); color – Atlantic #2404; 5, 6, 7, 7, 8, 9, 9 skeins, or for comparable yarn, approx 1080, 1215, 1345, 1470, 1625, 1780, 1915 yds / 990, 1110, 1230, 1345, 1485, 1630, 1750 m.
Long-tail CO, cable CO, circular knitting, decreases (ssk, k2tog), increases (RLI, LLI), stitch pick up around neckline and armhole, short row shaping at sleeve cap, and blocking. 9 page pdf includes pattern instructions, photographs, schematics, and definitions for relevant abbreviations. You'll find this pattern on sale on Ravelry individually and as part of a 2-pattern collection. Pattern inspiration blogged about here.